Nitrosamines (NA) have a wide a wide range of carcinogenic action; tumors may arise both under the action of nitrosamines and as a result of nitrosation of their non-cancerous precursors – nitrates, nitrites, amines and a number of other nitrogen-containing substances. There are singled out such characteristic properties of NA as their chemical resistance, high mobility in the ecosphere and a possibility of exogenous and endogenous formation from the precursors. As it is seen from the scheme where it is described the process of NA entering into the human body, this class of compounds includes various exogenous sources from the environment, indicating their interrelation with an endogenous synthesis of these compounds in the human body. An increase of NDMA concentration in biological fluids of an organism may give rise to the oncological alertness. In cases when high NDMA concentration is associated directly with the presence of a tumor in the body, monitoring of this indicator may be useful for control of treatment effectiveness. High concentration of NDMA in biological fluids may be one of the criteria for formation of oncological risk groups and may be applied along with the UBC and CYFRA21-1 markers in the quality of one of the additional diagnosis tests to detect bladder cancer (act of introduction of the technology, certificate № 460/2007 from October 29, 2008). 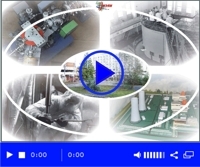 The programming and analytic spectroimetric complex is designed for assessment of N-nitrosodimethylamine concentration in food products and biological (body) fluids. Limit of the NDMA concentration measurement starts from 0,002mkg/kg. Volume of a sample for measurement is 0,5ml. Ratio error does not exceed 25 per cent. Photometer operating wavelength is 540 and 690nm. Measurement range of photometer optical density is from 0 to 1 B. Measurement technique Biological objects. N-nitrosodimethylamine identification with the usage of the software analytical spectrophotometric complex KANAS. Certificate of approval of the measurement technique (method) No.222.0080/01.00258/2012 dated April 23, 2012. Federal State Enterprise The Ural Research Institute for Metrology. Measurement technique Food products. N-nitrosodimethylamine identification with the usage of the software analytical spectrophotometric complex KANAS. Certificate of approval of the measurement technique (method) No.222.0081/01.00258/2012 dated April 23, 2012. Federal State Enterprise The Ural Research Institute for Metrology. Procedure of measurement of mass concentration of nitrite ions in surface waters and in potable water by the photometric method. Measuring technique МВИ МН 4285 – 2012. Certificate No. 705/2012 dated June 1, 2012. 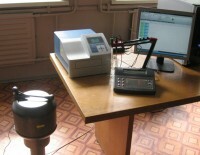 Republican Unitary Enterprise Belarusian State Institute of Metrology. Procedure of measurement of mass concentration of nitrite ions in beer by the photometric method. Measuring technique МВИ МН 4316 – 2012. Certificate No. 711/2012 dated June 25, 2012. Republican Unitary Enterprise Belarusian State Institute of Metrology. Software AC NDMA-01 designed for collection and processing of measurement results on nitrosamine identification is certified according to the requirements of measurement technique МИ 2174. Certificate of approval of algorithms (programs) No. 263.036 – 2012 dated April 26, 2012. Federal State Enterprise The Ural Research Institute for Metrology. it enables to work with small volumes of samples.